Yeah, parting is such sweet sorrow. Especially with people as nice as the Ivatans we've come to know. Had breakfast at the house of our guide-companion for the last 2 days, Philip. 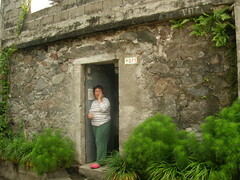 his mom, a transplanted Bicolana, has been calling Batanes home for three decades now. But having made friends over there, it would be a nice incentive to go back and discover more of Batanes, especially Itbayat and Sabtang (which we weren't able to do because of the limited time we had and the changing weather conditions). Lesson learned: it helps that your guide knows so much and is able to constantly give you information on where to go and what to do so you can make the most of your stay here. Our three days feel longer, thanks to Philip. look for him if and when you plan to go over to Batanes.